LDUCZ-V1041 Sagenodus fossil. Scale bar fans note, what we’ve gained in this being a standard scale bar, we’ve lost in its placement miles away from the fossil, well almost exactly 2cm away from it. In this full view, with the scale bar almost in the same postcode as the fossil, the painterly quality cannot be recognised. Here it is every so slightly zoomed in. Look at this one. It looks just like a painting. An underwhelming painting you’d expect to find in someone’s house who has spent the bare minimum to make it look like a place you’d like to rent in the estate agent photos, but a painting nonetheless. 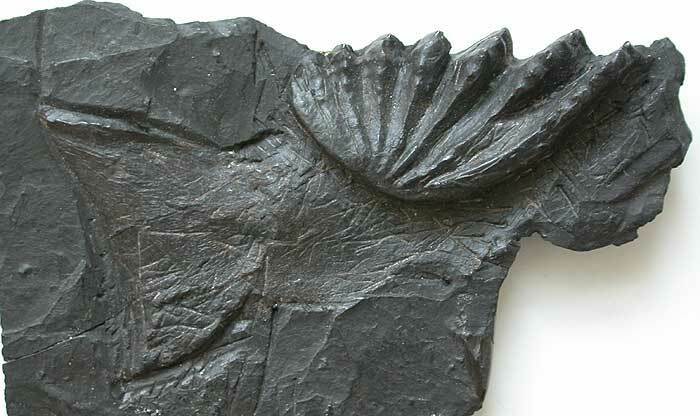 Don’t be fooled by this fossil’s resemblance to a burned pastie, it is a fossil. According to the ever-reliable museum label, this is a tooth plate fossil of Sagenodus sp. from the ‘coal measures’. Here’s what another slightly better Sagenodus tooth plate looks like and yup you can see the family resemblance. As the entirety of the one line Sagenodus Wikipedia article says: “Sagenodus is an extinct genus of prehistoric sarcopterygians or lobe-finned fish”. Use of the word prehistoric aside, I’d say that’s as succinct and comprehensive as a description you could get. All the interesting angles have been covered. I can’t really compete with that so I’ll wrap it up here. Just kidding! There’s plenty more to say, although be advised, almost none of it is interesting. Sarcopterygian fish are the group of bony fish which includes the living coelacanths, cats, northern hairy-nosed wombats, 1990s pop duo PJ & Duncan, chuckwullas, hamerkops and lungfish (from a strictly cladistic point of view). 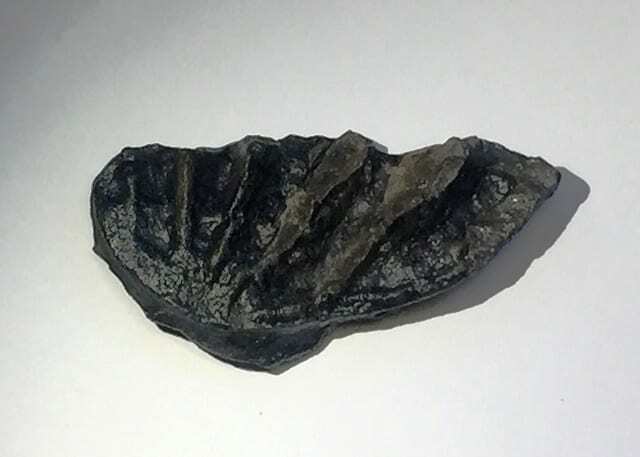 Although ‘coal measures’ can be interpreted to be a range of different coal bearing rock strata, this specimen is likely to be from around 300 million years ago and knowing the biases of the Grant Museum fossil collections, probably collected in the UK. If so, then it’s likely to be Sagenodus inaequalis, the only UK species in this genus. Preservation What we have here is a single tooth plate, a unique structure found in lungfish and their relatives. As illustrated in a previous even-less whelming underwhelming fossil fish of the month, these tooth plates aren’t like other kinds of teeth in vertebrates, these ‘teeth’ are formed on the inside of the jaw and the palate, to form a crushing plate. This fossil looks like it is one of the lower plates that would be on the bottom jaw. 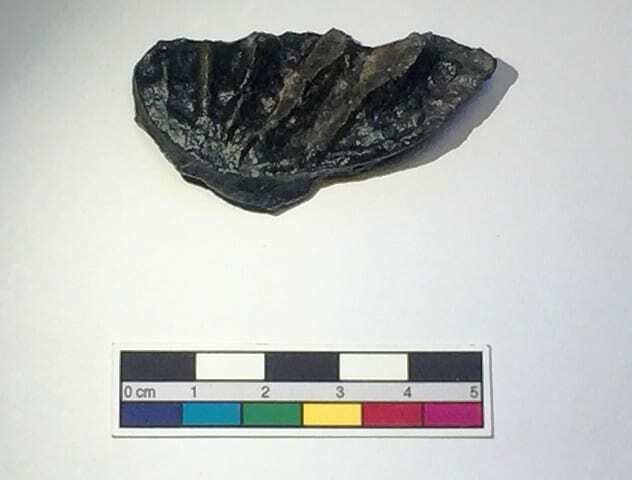 Although a well preserved Sagenodus tooth plate doesn’t look much different, this one does show a bit of wear, the flattened ‘ridges’ on the right hand side of the pastie in the images above, and I’m not sure if this is wear from ‘life’ or a consequence of taphonomy (how this tooth was preserved as a fossil). FUN PARTY TRICK: To differentiate between Sagenodus and related genus, Ctenodus tooth plates, Sagenodus has radially arranged ridges on the tooth plates and Ctenodus has more parallel ridges. Amaze your friends and enemies at parties with this neat trick. 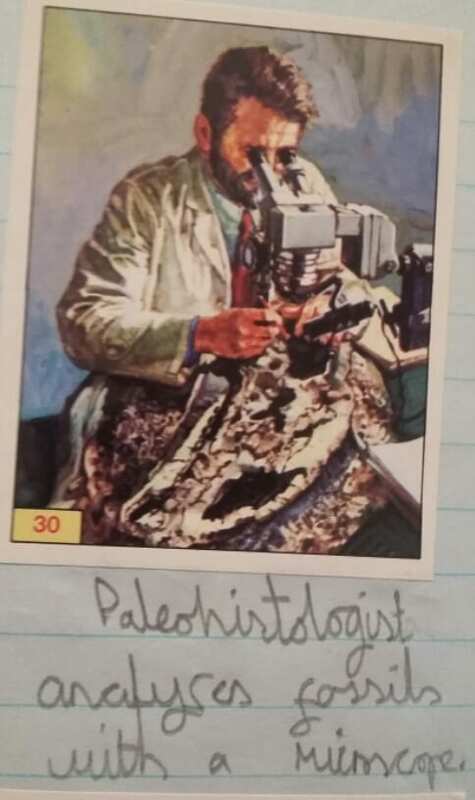 Scientific Research Many of the ‘greats’ of fossil fish palaeontology (many of which I first encountered by collecting stickers for the Palaeoichthyology Attax Panini sticker book) have contemplated Sagenodus. Everyone’s favourite first director of the Natural History Museum, Richard Owen first described Sagenodus. Agassiz, Woodward, Romer and even Edward Drinker Cope took a punt at the group, creating a few synonyms along the way. Trust me when I say, none of them had much of interest to say about Sagenodus, unless technical comparisons of ridge length and spacing, ridge width/height ratios and extent of denticulation on labial margins float your boat. Sagenodus was in the running for being one of the earliest lungfishes, but newer discoveries have heavens above is anyone still reading this? 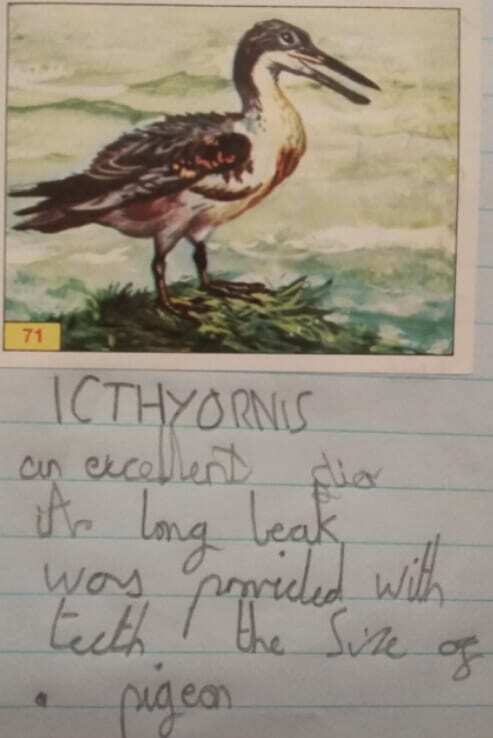 PRECOCIOUS (C) Dinosaur Spotting Handbook by Mark Carnall aged 10. Pigeon sized teeth (C) Dinosaur Spotting Handbook by Mark Carnall aged 10. More than 20 years later, SAME OLD SCHTICK. 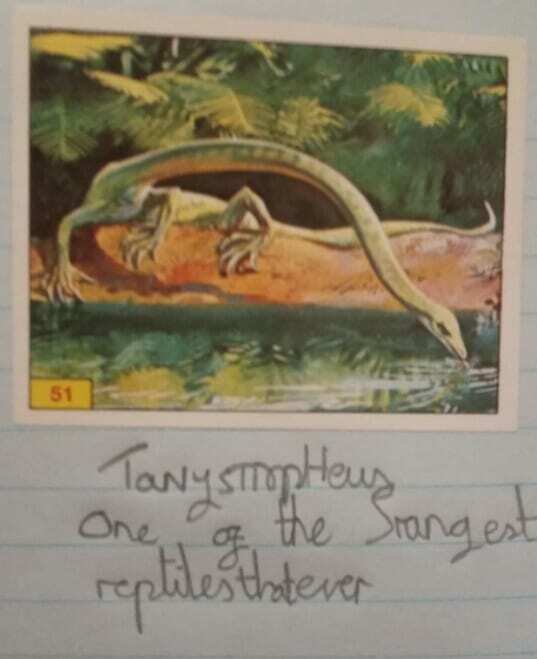 (C) Dinosaur Spotting Handbook by Mark Carnall aged 10. Hmmm, my first thought on perusing this just-ever-so-slightly-underwhelming specimen was of a gremlin’s ear. From the movie. You know the one. Gremlin imitation aside, I find the concept of grinding plates in fish quite interesting, and I was completely unaware of lungfish being in possession of such an amazing set of non-teeth. Thanks for the info. Most fascinating. Although I can’t enthral people at parties with the stuff I’ve learned on UFFoTM as I’m never invited to any. Hey ho. So impressed by this fossil. It is so black, black, everything is BLACK! Also, an ancestor of PJ and Duncan. Bonus! But mostly I want to request more entries in that superbly talented (if a little precocious) child’s sticker book. And wonder if he ever expanded to the ever educational cigarette cards (none of which mentioned the dangers of smoking)?